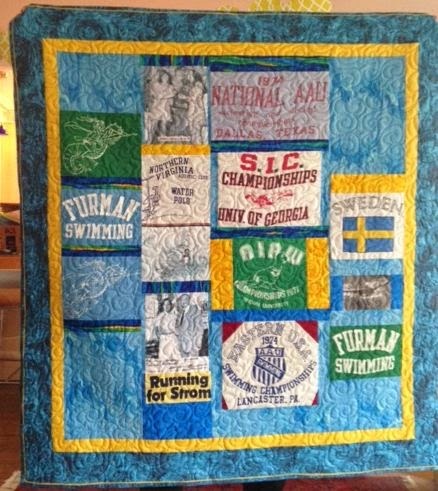 The first quilt in the March Parade is an oldie-but-goodie with a great story. Martha's MIL started this t-shirt for one of Martha's SILs in the 1980. As her MIL is now 91. Martha took the quilt home to finish it. This will be a treasure for your SIL, Martha! 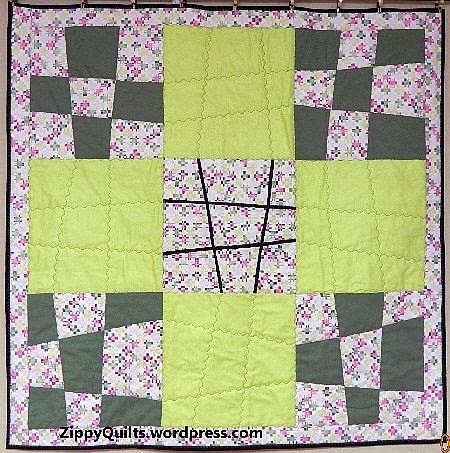 You can read the whole story on Mary's blog, Zippy Quilts. 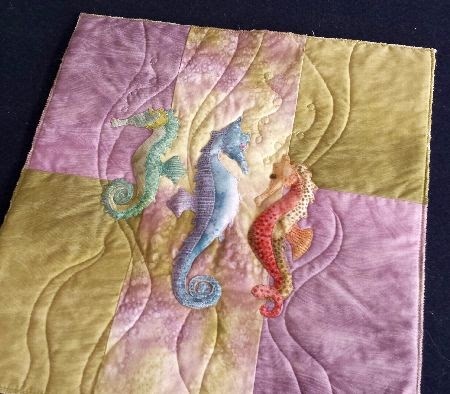 Debra's February finish is made with one of my favorite color combinations. It is called Chocolate Covered Cherries and is a freebie by Jo's Country Junction. 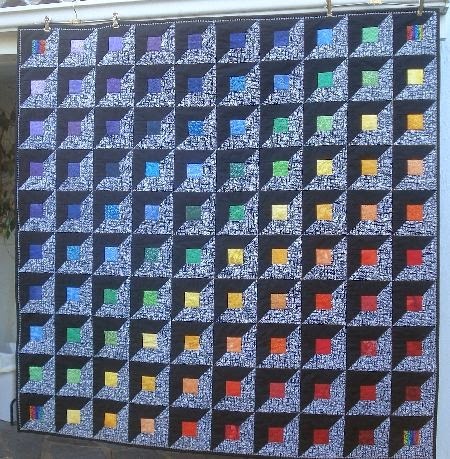 The quilt finished at 91 x 92 - she put just a little bit bigger border on it. Love that little investigator in the corner, Deb! Isn't Sue's February finish incredible? 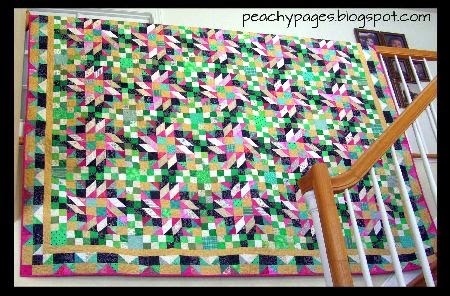 She calls it "Rainbow Lattice," and you can read all about it at Sue's Quilty Bits and Bobs. Sue promises a pattern, so watch for that! Here is the first "Grand Illusion Mystery" finish! Kerry, I am so impressed! 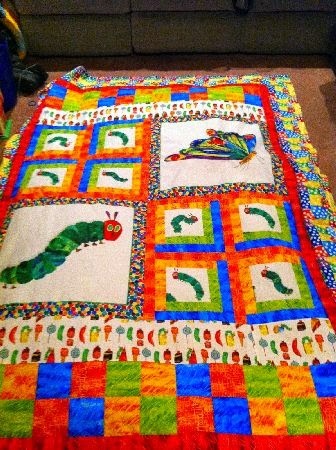 This quilt is so big, it's hard to get a photo that shows the entire thing. 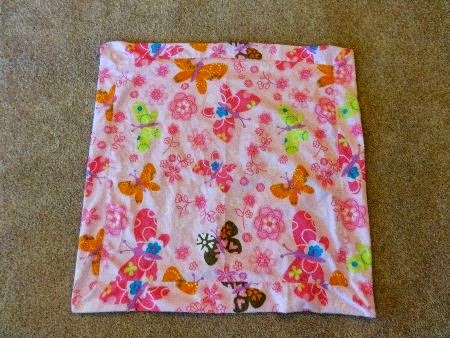 Arianna, I have some of that same fabric stashed away for baby quilts, too! 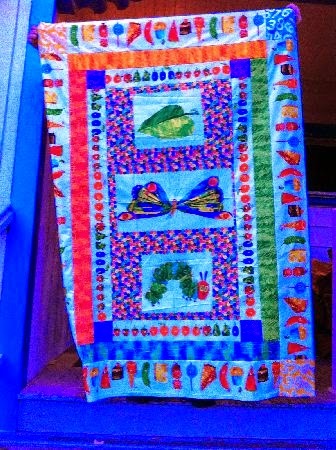 Arianna made this second quilt for her church's prison ministry. 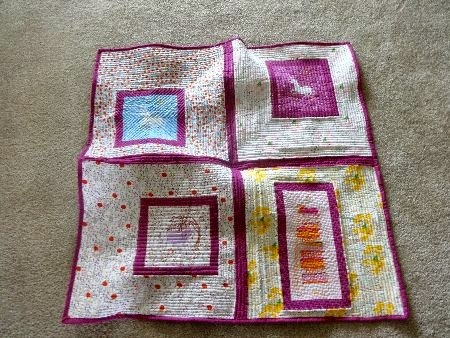 I think that looks a lot like the Missouri Star Quilt Co.'s self-binding baby blanket -- I just made two of those yesterday to take to a baby shower! 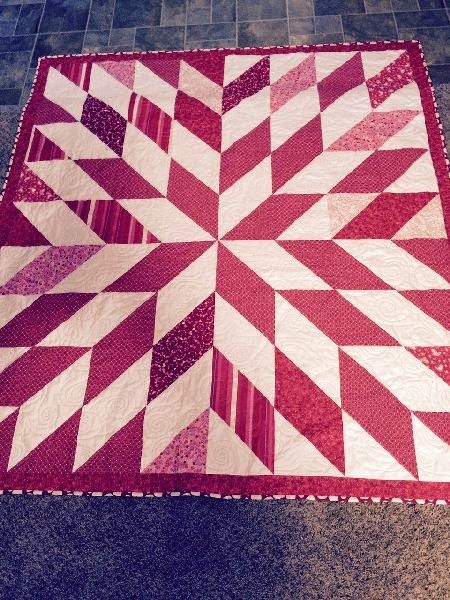 Gloriajean's February UFO just happened to be her Valentine's quilt. She calls it "With All My Heart." Heather, I love that pink binding! I may copy you! Read all about them at Peachy Pages. She says she's made enough, and the rest of this fabric line will be donated! That one went so well, she made "Koo Koo Puff." 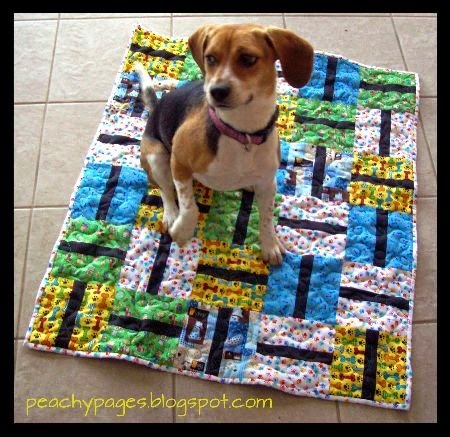 Read the story at What A Hoot, Lynette's blog (and take a peek at her pets on quilts photos!). 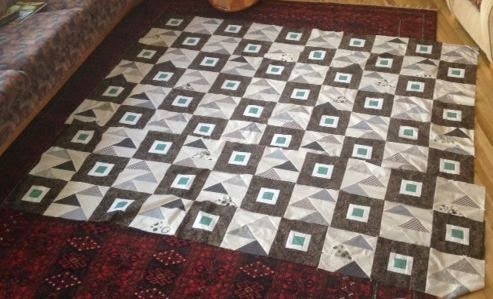 Even though Donna was without a sewing machine for three weeks during February, and this is her first attempt at paper piecing: Look what she made! Your lucky daughters are going to love these wall hangings, Donna! Martha sent in a last-minute finish. This is a larger "Staggered Geese," one she also finished for the December parade. 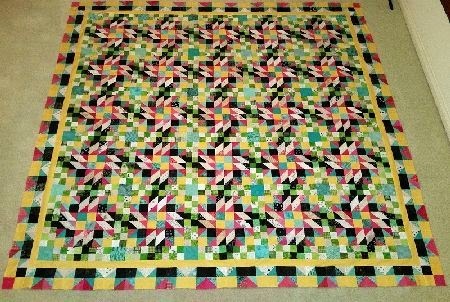 Even though I don't like making Flying Geese, I love this quilt! Thanks to the Random Number Generator, Lynette is the Parade Winner this month. Congratulations, Lynette! I'm sending you an email to ask for your postal address. Be sure to go to yesterday's post to comment for a chance to win the 3000 "Likes" on Facebook giveaway! 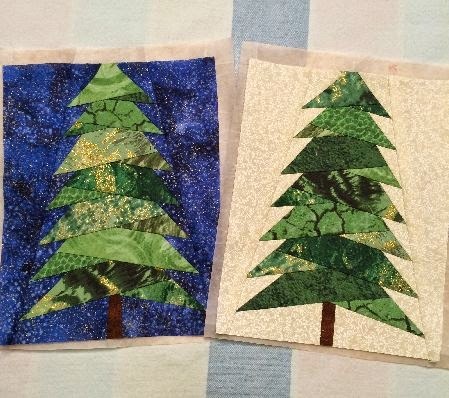 Lots of lovely quilts! 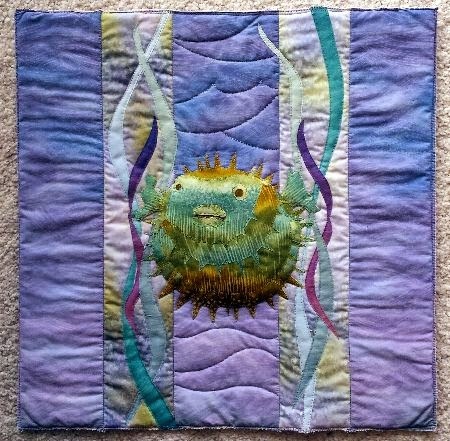 well done all those quilters, wonderful work. So much inspiration here. Hmmm! Beautiful eye candy! Thanks ladies. Great job everyone!! 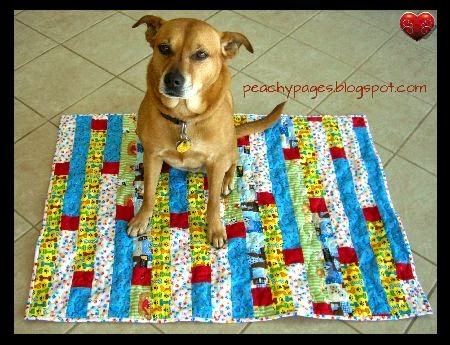 I love the variety in the types and styles of quilt. Woot! Woot! For those completing their firsts! Way to go, and keep up the great work! Wow, lots of finishes again this month, way to go everyone! Great finishes everyone. Well done! 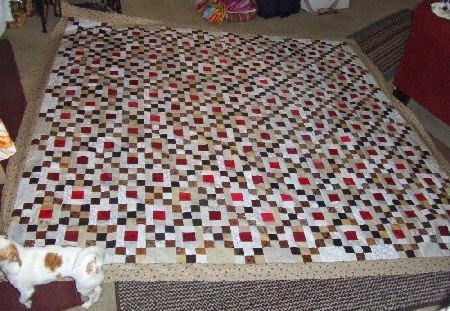 Love to see all your finished quilts. My #1 is Buggy barn hearts. I´m still working on it. Glad to get this help to get it finished. 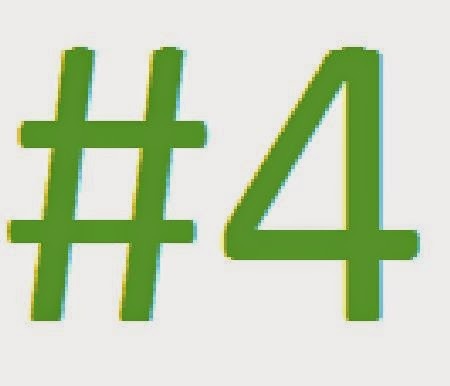 I do not know what my #4 is. I´m on a trip 500 kilometers from home and will not be back this week. May be my hearts is finished then?